Johnson Controls has extended the capacity range of its award-winning YORK YZ Magnetic Bearing Centrifugal Chiller to include chillers beyond 1,000 tons (3,516 kW), now up to 1,350 tons (4747 kW) of refrigeration. In early 2018, the YORK YZ Chiller, the first chiller fully optimised for ultimate performance with a next generation low-global warming potential (GWP) refrigerant—R-1233zd(E), was launched with a capacity range of 165 to 1,000 tons (580 to 3516 kW). The YORK YZ Magnetic Bearing Centrifugal Chiller is transforming the HVACR industry, having recently won the 2019 AHR Innovation Award in the Cooling Category due to its revolutionary technology. In 2019, Johnson Controls will be pushing the bar even higher by expanding the capacity of the YZ Chiller. The extended capacity, AHRI-certified YORK YZ Chiller uses an integral, variable speed drive and advanced magnetic bearing technology that features a single moving assembly suspended in a magnetic field that does not require lubrication. This technology requires 80 per cent fewer moving parts than traditional oil or refrigerant-lubricated drivelines. The result is enhanced reliability, reduced maintenance and improved efficiency. The YORK YZ chiller uses an optimised single stage design to provide industry-leading, real-world energy efficiency. 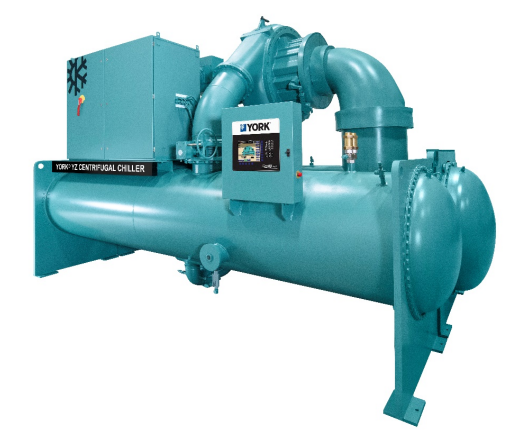 The chiller’s system simplicity, high reliability, lower maintenance and wide operating map are all achievable due to the advanced lubrication-free magnetic bearings that can handle any operating condition with the technology now available at even higher capacities.